Tell me if your brain works like mine. I often think about how few things there are left to “invent” or “discover”. When I was little, I distinctly remember my little girl brain thinking that if I’m ever going to write a song, I better hurry up and do it now. Because pretty soon there aren’t going to be any songs left that someone hasn’t already written. I still think it’s crazy that people are able to write original songs. How are all the note combinations not used up? There aren’t any “lands” left to discover. Google Earth has an image of every square inch of the globe. No uninhabited islands left to find and claim as your own, Swiss Family Robinson style. I especially worry that there aren’t going to be any revolutionary “food” discoveries. Besides the cronut, I can’t think of too many completely original new foods that have been invented recently. Maybe a few new food combinations here or there. But nothing life changing, like discovering chocolate. How did someone even think to make chocolate? Well, fear not. There are still food discoveries left to have! After tasting this cilantro lime ranch dressing I can confidently say I had a life changing “HOW have I never tasted this before?! How is this not served on everything? !” moment. I love ranch dressing (like, really love), and I love Mexican food. This cilantro lime ranch dressing is a match made in food heaven. While these tacos are amazing, the real star here is the cilantro lime ranch dressing. The dressing is made with cilantro, lime, roasted tomatillos, roasted jalapenos, roasted garlic, ranch seasoning mix, greek yogurt, and a little milk. You throw it all in a blender, and then try to restrain yourself from eating with a spoon. While this sauce is perfect for tacos, I also use it on salads, in sandwich wraps, burritos, ice cream. Ok, just kidding about the ice cream. But if a little bit of this somehow dripped onto some vanilla ice cream, I’d eat it no sweat. I’m not gonna waste it! Make this for Cinco de Mayo and blow everyone away. Dressing: Preheat oven to 450. Roast the tomatillos, garlic cloves and jalapenos, whole. 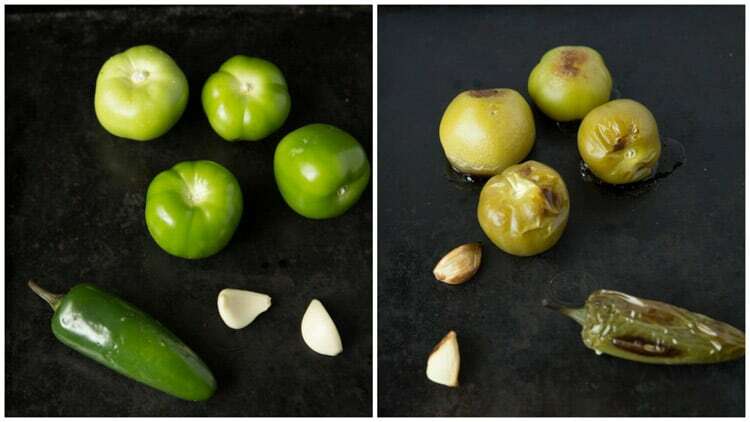 After 10 minutes turn the tomatillos and jalapeno, remove the garlic since it should be golden and roasted. Return to oven for another 10 minutes. Remove from oven, allow to cool for a few minutes. Peel the skin from the jalapeno, slice the jalapeno in half and remove the seeds. 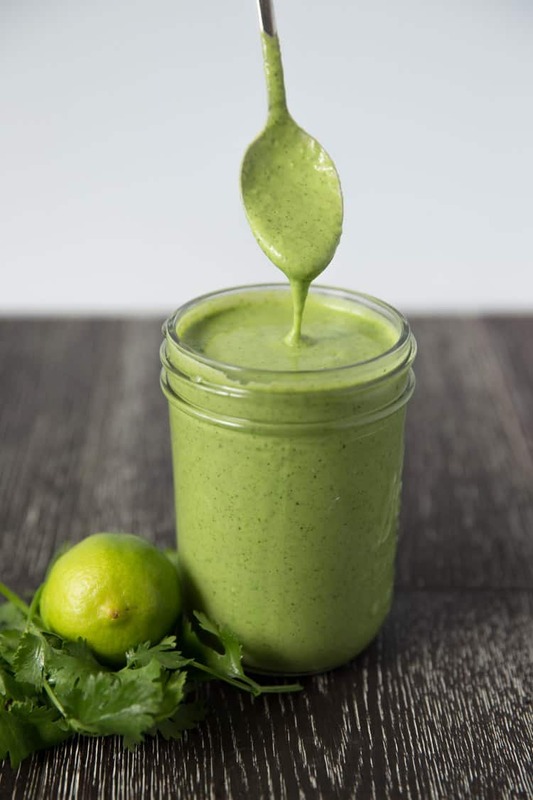 In a blender, add the charred tomatillos, jalapeno, garlic cloves along with the lime zest, lime juice, cilantro, ranch dressing mix, greek yogurt, milk, salt and pepper. Blend until combined. Makes 1-1/4 cups. Will keep in the fridge for 1 week in an airtight container. 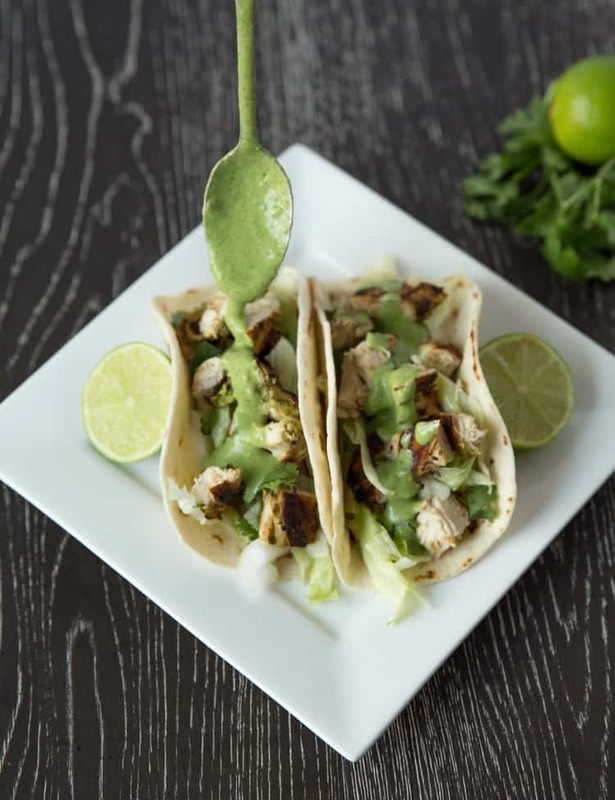 Tacos: Marinate the chicken in 1/4 cup of the cilantro lime ranch dressing for 30 minutes. Preheat grill (or indoor grill pan) over medium high heat. Grill the marinated chicken until it is cooked thru, about 8 minutes per side. Allow to cool for 5 minutes before dicing into 1/2″ cubes. 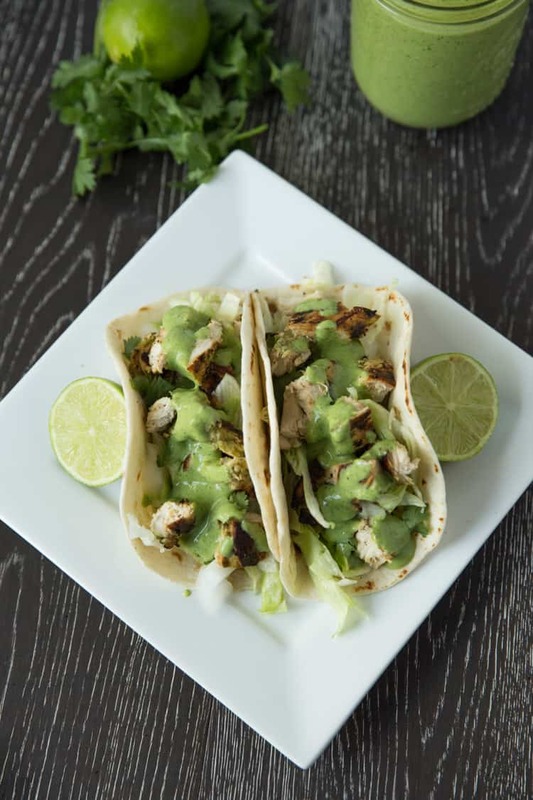 To assemble the tacos, warm the tortillas then fill with chicken, shredded lettuce, onions and top with cilantro lime ranch dressing. This sauce is medium spicy. If you like it mild, only add half the jalapeno. If you like hot, add in the jalapeno seeds. Do I have to wait until May 5? I kinda wanna fact plant into this taco for breakfast, and than take my shower in cilantro lime ranch. Too far? Didn’t think so! This sounds so good girl! Pinning! Natalie you are too funny. Totally agree with you about the chocolate. — whoever had the amazing idea to turn a little bean into actual chocolate is a freaking genius. And I’m totally loving these tacos and that dressing! Gahh! It looks so good, I’m pretty sure I could just dip a spoon in that jar and be happy for the rest of my life. My family loves taco night, so I will definitely have to try these tacos for dinner one night and for Cinco de Mayo! pinned. These look awesome — I can practically taste the freshness! And I laughed out loud at the chocolate hero reference . . . you are SO right. I have nearly all the ingredients needed for these, Nathalie … I can even get some elusive-in-Greece cilantro which I spotted at the supermarket today. So this may just be tomorrow’s lunch! The dressing sounds incredible! This dressing is right up my alley Natalie. I love all the ingredients you put into it. Divine. I can probably just drink it through a straw. Haha. Can you believe I am yet to taste a cronut?! I love cilantro, and this dressing looks so delicious and creamy! Yum. A perfect taco topping! we had regular tacos for dinner last night. i had been looking allllllll day for something more creative, but couldn’t find a thing. this might solve that problem. I don’t know… the sauce might be tasty on ice cream too because it looks and sounds AMAZING! I am always up for new taco recipes and I KNOW my entire family would love these. This looks great! I could drink that sauce, but I’ll slather my tacos with it instead. Love these tacos Natalie and the dressing is wonderful. I can see myself eating this on many different kinds of food. It’s funny you mention the song thing when I was very young my cousin and I were going to start a band and we created a song and were worried that somebody else would come up with it. Well no one did, we never learned to play any instruments and neither of us sing. Crazy kids! Haha I love the way your brain works, I completely get it, I definitely find myself pondering things I think so many people take for granted, like whoever did invent chocolate anyway!? My boyfriend just doesn’t understand it so it’s nice to know I’m not the only one! Anyway, this cilantro lime ranch dressing sounds/looks phenomenal. I cannot wait to try it, I can think of at least a dozen things I want to try it on! I really enjoyed this post!! Totally thought about songs that way, and food. ESPECIALLY food. Looking at pinterest and seeing everyones genius ideas and feel like there can’t possibly any more inventions left. Yes, chocolate so strange how they came up with it by looking at a bean!! Anyways, this cilantro lime ranch dressing sounds like perfection…and note, this is a person that isn’t a huge fan of ranch. However, i’ve had it with tacos, and strangely it’s a fabulous combo. Adding cilantro and lime…awesome Natalie!! I absolutely LOVE cinco because I have a slight obsession with any mexican food :D Thanks girl! Ok, I have to make this immediately. Like IMMEDIATELY. I think I may love ranch dressing just as much as you do, and I am dying over this dressing. It sounds kind of perfect for Cinco de Mayo, ya know? I won’t be able to wait until then though. Definitely making these this week. Pinned (times a million)!! These look amazing Natalie! I love tacos and that dressing sounds so good! That dressing! YUMMM. Cilantro lime + Ranch sounds AMAZING. And awesome on these tacos. Pinning! Too funny – I’ve distinctly had the same thought about people continuing to whip out original chords and melodies with songs. A guitar has six strings. How do they do it??? Yes, I have a crazy brain just like that!! I think all the great ideas are already out there. Then I come across something ingenious like this Cilantro Lime Ranch Dressing! Why didn’t I think of this?!! Looks and sounds absolutely delicious!! I can’t wait to try this :D Pinning!! I totally have those same thoughts…how will there always be something new? But then again the food world is probably like fashion and things just come out from the wayy back of the closet. (like overalls?? now in skinny jean form?) anyways, these look amazing and i’m pondering how to find all the ingredients. the one mexican store has a decent selection, but i might have to buy some canned tomatillos. i’m sure it will be worth it though! can’t wait to try it! I love how I read that first sentence as “Tell me if your brain works”… and I thought “ehh, sometimes?” lol clearly an inventor or discover-er (word?) I am not! 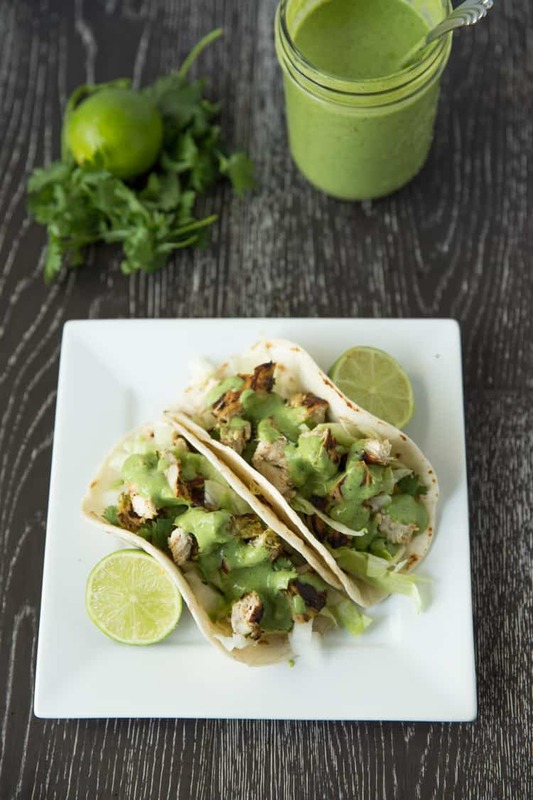 not only do these tacos look fab but that dressing is to die for, pinning! I can think of a million different things I would top with this amazing Lime Ranch Dressing! To say that ranch is my favorite dressing would not even come close to how much I really love it and adding another favorite of mine – limes… you’re a genius!! Seriously. I need this dressing in my life! And on everything I eat! It might be weird to call a dressing pretty, and I don’t care. This dressing is so pretty. I’m the same way when it comes to songs. How in the world do people do it?! Maybe it’s because I’m not very musically inclined. Those people that are truly have a gift! 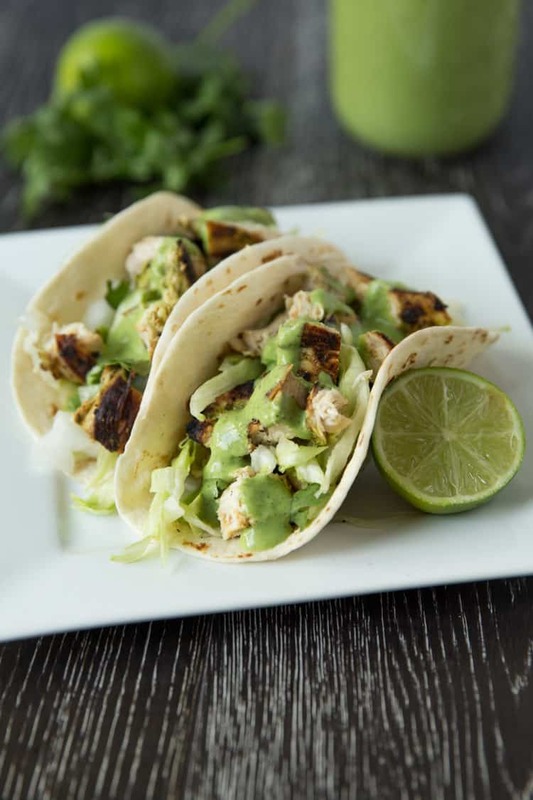 I can’t remember the last time I had chicken tacos but these look so delicious! I’m definitely going to try making that dressing! Yum!!! This dressing looks amazing. I can imagine using it on so many things. It’s like a spiced up green goddess dressing with Mexican flair. If your brain is constantly on tacos like mine, then yeah, I’d say we’re sharing the same brain! These tacos look incredible, Natalie! That cilantro dressing? Killerrrrr. Sounds so good! Your pictures are wonderful too!! I just love cilantro and tacos and usually overload my tacos with it so your dressing sounds just perfect! I can really imagine dipping the tacos into more of that goodness. I’ve been wanting to get over here and check out your chicken tacos. But oh my days have been way too busy. But anyway, I’m here not and they were worth the wait! They look oh so good. I’m sure the whole family would enjoy this little twist from our usual. Have a beautiful Thursday Natalie! Delicious! I’m always impressed at the creative new food ideas people come up with! Have you seen the mini series, Cosmos? I think the same as you when it comes to science.